The United Nations Mission in the troubled Central African Republic, known by its French acronym, MINUSCA, has given armed groups in the north of the country 48 hours to clear out. The Mission wants to clear a 50 kilometre perimeter around the town allowing displaced persons to return. Over the last three weeks, some 60,000 people – mostly women – left everything behind to escape clashes between the armed groups Justice Riot (RJ) and the National Movement for the Liberation of the Central African Republic (MNLC). They ended up in Paoua, where some 40,000 residents took them in. Now the food and water is running out. AUDIO: Najat Rochdi, Humanitarian Coordinator in the Central African Republic, provides an update on the fighting in the north of the country. 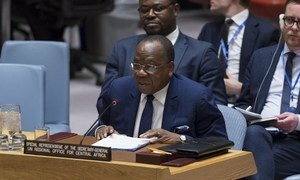 Despite some positive developments, the overall situation in Central Africa still requires concerted action at all levels to address sociopolitical tensions, economic difficulties and abuses by armed groups, a United Nations envoy for the region said Wednesday.